The government launched its Action Plan for Education today. 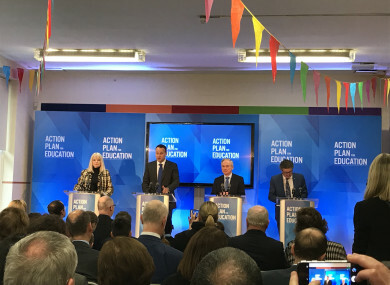 TAOISEACH LEO VARADKAR and Minister for Education Richard Bruton this morning launched the Action Plan for Education 2018, which ambitiously aims to make Ireland’s education and training system the best in Europe by 2026. Bruton launched a three-year plan in 2016, and today’s plan lays out five major goals the Department of Education has for the next nine years, such as the focus on STEM subjects at Junior Certificate level and trialling new assessment methods in the senior cycle. One major goal of the plan is to improve the progress of learners at risk of educational disadvantage and learners with special educational needs. Under this goal, the Department aims to launch an update on the 2005 Deis schools plan and to narrow the gap between Deis and non-Deis schools in attendance, achievement and retention, and in developing better progression pathways for learners in Deis schools. A new database system will be launched to help assess levels of disadvantage to help identify schools needing additional supports. Further to this, the goal seeks to address the barriers to higher education and put a better focus on apprentices, Springboard courses and Post-Leaving Certificate courses. The action plan also outlines the Department’s plans for Science Technology, Engineering and Mathematics (STEM) subjects and projects. The Department plans to formally recognise outside-of-school STEM initiatives being undertaken by students at junior cycle. There will be a development of new summer courses in STEM subjects and industry placements for teachers. It aims to see a 20% increase in students doing STEM subjects for the Leaving Certificate and a 40% increase in female participation. “We’re trying to make sure we equip young people with the capabilities they will need in a very rapidly changing world. Whether it’s digital, or STEM, or foreign languages, we need to be the best,” Bruton said. To accompany today’s launch, the Department of Education announced in January that students at 40 schools will begin studying Computer Science for the Leaving Cert from next September. The first Leaving Cert exam in the subject will be sat in 2020. This will be the first of Leaving Cert exam to take place through online assessment. At the launch today, Taoiseach Leo Varadkar said that there will be an increased focus on foreign languages at second level. He noted that there will be one positive outcome of Brexit – that British universities might no longer be part of Erasmus, which he regretted not doing himself, so more Irish students may have to travel further afield and maybe through other languages. Improve national planning and support services. Email “Science, maths and languages: The plan to make Ireland's education the best in Europe ”. Feedback on “Science, maths and languages: The plan to make Ireland's education the best in Europe ”.